Step onto our stage. Imagine a bold vision for yourself in a department committed to leading the future in arts education through rigorous training, interdisciplinary collaboration, and faith-focused community. Picture a place that is both Nashville-centric and globally informed, bursting with outstanding faculty and a network of industry professionals committed to cultivating you into an artist ready to impact your community and the world. At Lipscomb University, this vision can be your reality. 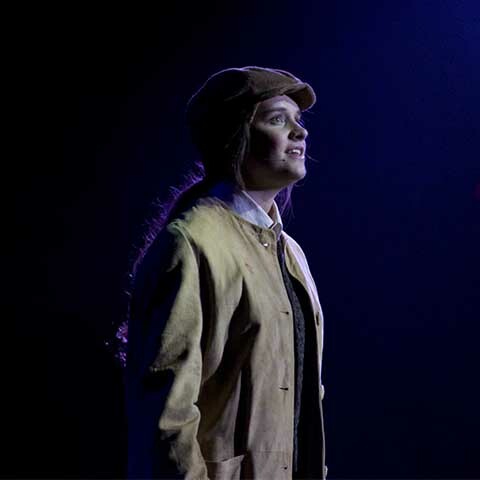 A cornerstone of the George C. Shinn College of Entertainment and the Arts, the Department of Theatre offers world-class education coupled with Christian perspective that does not avoid the difficult or unpleasant, but explores the spiritual response. We believe when talent intersects will, artists can create a better world, one production at a time. If this interests you, explore our website and apply! Choose from four B.F.A. degree offerings, including musical theatre, acting, directing, and design to focus your artistic and academic interests. Join our in-house dance company Foundation Dance Theatre or pick up a dance minor to elevate your artistic expression and enhance your marketability. Cross-train between theatre and education to prepare for a career in theatre teaching. Lipscomb’s College of Education is ranked #2 in the nation. Every year, our department collaborates with local professional theatre companies, including the Nashville Repertory Theatre, Nashville Shakespeare Festival, Blackbird Theater Company, and more. These collaborations are integral to our identity and fundamental to our training. Students have the unique opportunity to work alongside professionals, either onstage or behind the scenes, as part of their undergraduate experience. These collaborations offer real-time professional experiences and the chance to connect with people working in the industry right now. Central to our artistic work is the cornerstone of faith. Students explore the intersection of faith and art through coursework, productions, theatre breakout chapels, and service opportunities. The faculty take the responsibility of walking out their faith daily with the students as well. Lipscomb is committed to hosting visiting artists with strong professional credentials. Previous artists include Broadway performers Eden Espinosa, Kate Reinders, Sarah Litzsinger, Chuck Wagner, Eric Petersen, Emily Ferranti, and more national touring artists. Major playwrights include John Patrick Shanley, Tina Howe, and Nashville-favorite Nate Eppler. Lipscomb also hires many local artists to share their areas of expertise. For 2016-2017 and 2017-2018, famed Something Rotten! composer Wayne Kirkpatrick served as Artist-in-Residence. Students are encouraged to participate in internships throughout the city and country. Our students have served at several prestigious theatres including Nashville Children’s Theatre, Nashville Repertory Theatre, Berkshire Theatre Group, Barrington Stage Company, Creed Repertory Theatre, Florida Repertory Theatre, Orlando Shakespeare Festival, Peach State Summer Theatre, Great River Shakespeare Festival, Des Moines Metropolitan Opera, and the Nashville Shakespeare Festival. Theatre students have a unique opportunity to spend 10 days in London studying theatre and attending productions on the West End. We are currently planning the next trip for summer 2019. BFA students are now required as part of their courses to take a one-week trip to New York City to attend important educational workshops and see Broadway shows. Students will take this course in the winter of their senior year. Our department boasts an advisory board of Nashville’s finest theatre professionals from the Nashville Shakespeare Festival, Nashville Repertory Theatre, Studio Tenn, Blackbird Theater Company, and others. We lean on these working professionals for guidance and support as we craft the strongest department and seasons possible. The Tennessee Performing Arts Center (TPAC) is a private, non-profit organization dedicated to providing and supporting the presentation of the performing arts. TPAC’s mission is to lead with excellence in the performing arts and arts education, creating meaningful and relevant experiences to enrich lives, strengthen communities, and support economic vitality. Its four stages are home to Nashville Ballet, Nashville Opera, Nashville Repertory Theatre, HCA/TriStar Health Broadway at TPAC, TPACPresents, and a variety of special engagements. TPAC administers one of the largest and most comprehensive arts-in-education programs in the United States, offering learning opportunities for adults and serving more than 1.5 million students from pre-school to high school over the past two decades. TPAC is the largest performing house in Tennessee. In 2016, TPAC and Lipscomb University Department of Theatre began collaboration in hosting the Nashville High School Musical Theatre Awards, or Spotlight Awards. Nashville Repertory Theatre (NRT) exists to serve through creating “Ah-ha!” moments that inspire empathy, prod intellectual and emotional engagement, and expand the creative capacity of audience and artists though the dynamic connection unique to live theatre. NRT seeks to be a strong and vital professional regional theatre that is an indispensable part of our community's creative life, widely embraced and deeply valued as an essential source for illuminating artistic experiences and exciting entertainment, and recognized as a model of sustainability that is home for a thriving community of professional artists and whose name is synonymous with excellence in every aspect. Nashville Repertory Theatre was founded in 1985 by Martha Ingram and Mac Pirkle as an outgrowth of a production company formed in 1983 to produce the first work for the education program for the new Tennessee Performing Arts Center (TPAC). In April 2018, NRT and Lipscomb University presented an exciting co-production of Inherit the Wind at TPAC. The mission of the Nashville Shakespeare Festival (NSF) is to educate and entertain the mid-South community through professional Shakespearean experiences. NSF enriches and unifies the community with bold, innovative and relevant productions along with empowering, participatory educational programs, setting the community standard of excellence in educational outreach and performances of Shakespeare’s plays. During its twenty-seven year history, the Festival has grown into one of the region’s leading professional theatres. In 2017, NSF partnered with Lipscomb University's Department of Theatre to present an all-female Richard II featuring a mixed cast of professionals and students. Since their start in 2010, Blackbird Theater has gained acclaim as Nashville’s most intellectually adventurous theater, mounting elaborate productions of literate scripts with many of the region’s top actors and theatre designers. Past shows include the original comedic thriller Twilight of the Gods (named Best New Play in the Nashville Scene’s “Best of Nashville 2010” edition), Tom Stoppard’s Arcadia, G.K. Chesterton’s Magic, John Logan’s Red (for which Dean Mike Fernandez won “Best Director”), and the rarely produced Stephen Sondheim musical Pacific Overtures (named 2012’s “Best Musical” by the Nashville Scene). Their 2013-2014 season included George Bernard Shaw’s Man and Superman directed by Beki Baker, and Roger’s Version, an adaptation of a John Updike novel. In 2015, Blackbird mounted an original musical called Myth, and in 2016 produced The Crucible in conjunction with Lipscomb University Theatre. Blackbird is a professional non-profit theater company founded by Wes Driver and Greg Greene, Lipscomb Theatre alumni. Many of their shows are directed, designed, and performed by Lipscomb theatre faculty and students, as well as Nashville theatre professionals. All of these productions save Myth were produced at Lipscomb University. Foundation Dance Theatre (FDT) is the resident dance company of Lipscomb University's Department of Theatre. FDT's mission is to create movement that tells strong stories and explore all styles of dance including jazz, modern, tap, Broadway jazz, hip-hop, and more. The company is under the direction of Lipscomb dance faculty members Kari Smith and Leigh Anne Ervin. Company members include Lipscomb students with a strong dance background and a passion for telling stories through dance. Students from any department on campus may audition for FDT during their bi-annual auditions. FDT rehearses on Friday afternoons and performs several times a year, both on and off campus. Their annual dance concert, Elevate, is one of the highlights of the year for many students and patrons. Please email Kari.Smith@lipscomb.edu or Leighanne.Ervin@lipscomb.edu for more information. The Nashville High School Musical Theatre Awards, or the "Spotlight Awards," has been a huge success since its inception in 2013. The mission of this program is to unite high school musical theatre programs in Nashville and its surrounding counties, offering adjudication, special workshops, and an exceptional awards ceremony. In 2016, Lipscomb University's Department of Theatre and the Tennessee Performing Arts Center (TPAC) collaborated to develop and host the event together, securing one of the most unique partnerships in Nashville. Thousands of high school students have participated in the exciting program, and in May 2017, the awards ceremony moved to TPAC's Andrew Jackson Hall, the largest performance stage in Tennessee. Thanks to TPAC's membership in the Broadway League, the Spotlight Awards can send the qualifying outstanding lead actor and outstanding lead actress to the National High School Musical Theatre Awards or the "Jimmy Awards." This is a fun-filled and challenging ten day event each June featuring the most talented high school actors from all over the country working with the best of Broadway. Area high schools are invited to submit one musical per school year. TPAC/Lipscomb then sends several adjudicators, including theatre professionals and Lipscomb University faculty, to view one of their performances. Each May, all participating schools are invited to Lipscomb’s campus for a day of workshops taught by industry professionals, and then to an awards ceremony at TPAC hosted by a special guest. Past hosts have included Broadway performers Chuck Wagner, Elizabeth A. Davis, Miles Aubrey, Erica Aubrey, and American Idol performer Melinda Doolittle. New for 2018-2019: If your school was one of the Top 10 schools for Best Show last year, you have a spot held for you for the 1st week of registration. If you have not turned in your application by Wednesday, August 8, you will then be able to apply on a first-come, first-served basis with other schools. We will accept applications until we are at capacity. Each school is allowed up to 40 students to attend the workshops. All registered schools will be invited to attend the ceremony. Tickets to the ceremony will be provided for up to 40 per school. Any additional seats may be purchased via TPAC's ticketing site. Mandatory School Orientation – All participating schools are required to send at least one person to this meeting (Director preferred, but if not available another adult from the school will need to attend). This meeting will happen at TPAC on October 2, 2018 from 4:30-7:00 p.m. Window for performances to be adjudicated: November 1, 2018-April 20, 2019. Nominees will be announced April 26, 2019. Workshop/Awards day will be Saturday, May 11, 2019. Once we receive your completed registration, we will coordinate a team of adjudicators to view one of your performances. All adjudicators receive special training hosted by TPAC to ensure as equitable and balanced a process as possible. They will each have a rubric that will be the scoring for the show. Their completed rubric will be sent to you after the performance. At the end of the school year, TPAC and Lipscomb will compile the critiques and scores from each show to determine the awards. Each school will receive more information on additional registration and the specific details of the workshop/awards day. Please view the Participation Guide for additional details. We love our Theatre alumni! They are our past, our present and our future. Please keep contact with us via Beki Baker at beki.baker@lipscomb.edu. Let us know your current plans, exciting news, and prayer needs. Consider joining our networking group, Lipscomb University Theatre Alumni, on Facebook. A career in the arts – is there such a thing? Yes! We believe graduating students have the skills to work in over fifty entertainment-related positions. This department strongly encourages students to pursue internships during their college career to prepare them for the industry and to establish strong networking connections. We also believe in developing well-rounded artists who can work in a variety of positions. There are also less obvious applications of theatre degrees. Law schools, medical schools and companies of all kinds understand how theatre training can equip someone with integral life skills including working within a deadline, collaboration, stamina, conceptualization, analytical thinking, fiscal responsibility, creativity, communication, management, problem-solving, and the confidence to embrace new ideas.